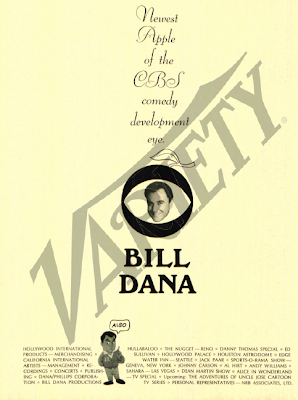 Kliph Nesteroff: The comedy team of Dana and Wood was actually under contract to NBC at one point. 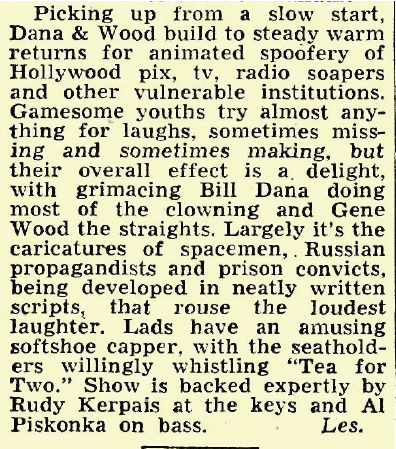 In 1952 you and Gene Wood were placed in their comedy development program. 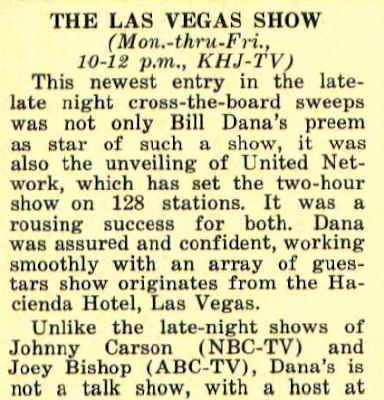 Bill Dana: Yes, well, there were a lot of folks in that. Woody Allen was among them. 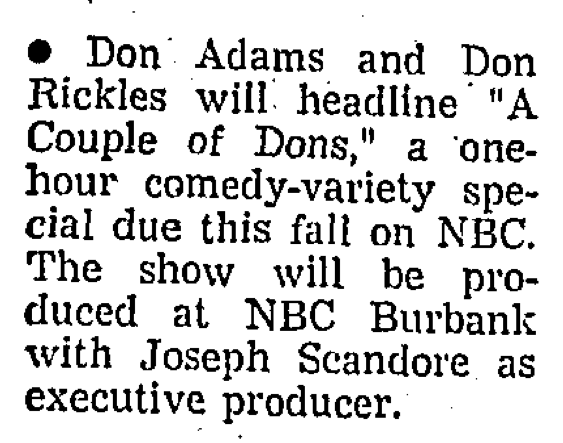 I would imagine we would have been among the very first involved with their comedy development program. Do you have any of the other names? 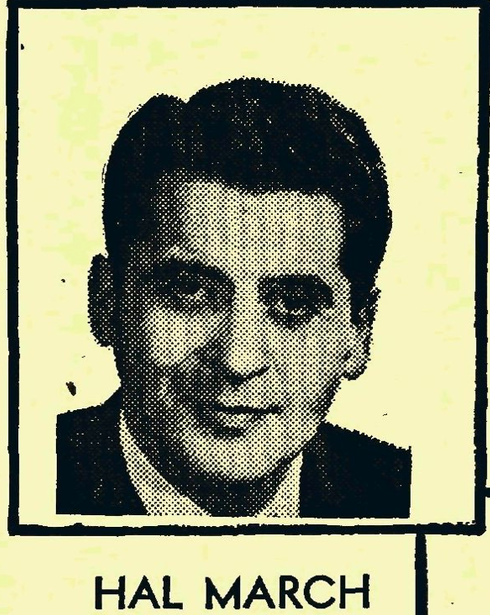 Bill Dana: Don't know that name. Kliph Nesteroff: Others in the program were Woody Allen, Paul W. Keyes and a guy named Bernie Illson, who ended up doing publicity for Ed Sullivan. Bill Dana: Paul Keyes was a writer and I worked with him for a little while. He became very political and very far-right. Nick Vanoff used to stick his head in and say to him, "Have you finished your novel yet?" He was much more of a politician. 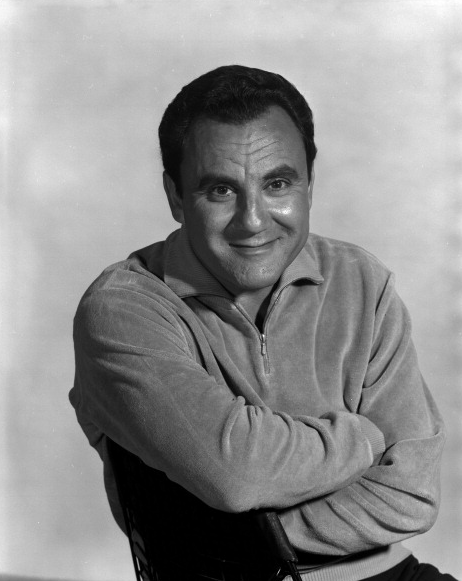 He went on to work for George Schlatter and became famous as part of the Nixon group. Have you interviewed George Schlatter? Kliph Nesteroff: I've become friends with him, actually. We became friendly about a year and a half ago. 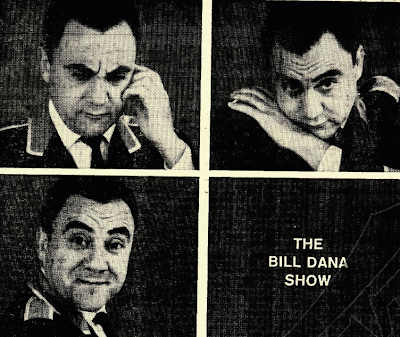 Bill Dana: He's one of the stars of talent and niceness. He's just a wonderful and nice guy. Kliph Nesteroff: He's a larger than life guy. 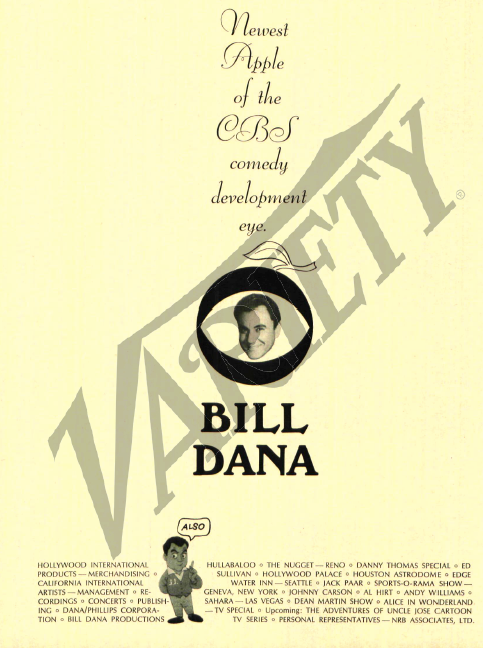 Bill Dana: Very much so, but it is totally fulfilled. There's no mystery about him. He's all real. Nothing fiction. Kliph Nesteroff: Yes, he has been very, very good to me. 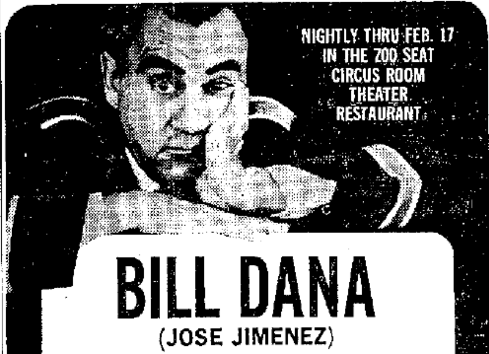 Bill Dana: Well, if you talk to him, tell him I love him more than myself. Kliph Nesteroff: I will let him know. I speak to him every other week or so. Kliph Nesteroff: But this comedy development program that you were in with Gene Wood... what did they have you doing? Kliph Nesteroff: Like an internship? Bill Dana: Yes, but with an extra heap of political insider stuff. 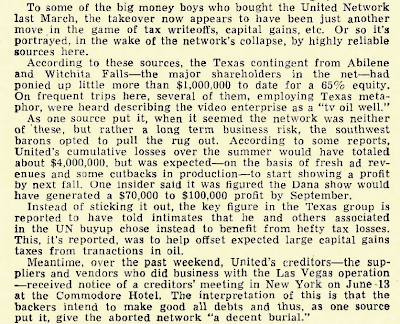 It started when the sons of executives were brought on like a cadet program. We became part of that first comedy development program and Woody and I have talked about this - so I believe he would have been in the same one. If not, then it would have been just a beat after us, simply because of the age difference. I've known Woody Allen in several phases. We met first in England when we were both appearing over there. Don Adams - and this won't be any secret - "borrowed" a lot of Woody's stuff. That wasn't uncommon. 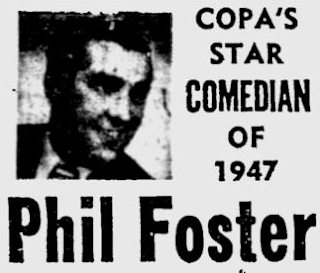 There's a famous story about Phil Foster sitting in a coffee shop up in the Mountains and he overhears two comedians fighting. He asks the server, "What are they fighting about?" "Oh, they're fighting about who stole their Phil Foster routine." It's a classic story of that genre. Gene Wood and I prided ourselves on the fact that every single word we did as performers we wrote ourselves. Although we may have suffered a little from that. On the whole, we had a good reputation for being new... and useful (laughs). 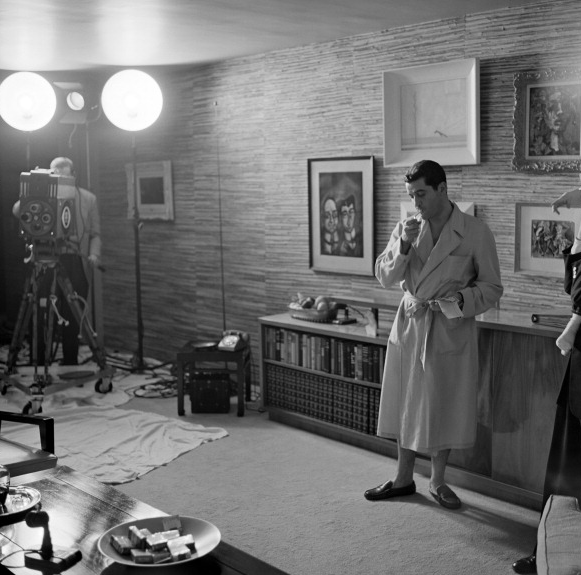 Gene and I would always remain friends even though we saw very little of each other later during our careers. I had a Jewish punim. You know what a punim is? Bill Dana: Ah, well then the first thing you need to do is study Yiddish! No matter how you slice it, that's the basis of human comedy, the suffering of the Jews. But a punim is a face. We tried to design ourselves as two Sid Caesars as opposed to Abbott and Costello. I had the bug eyed, little guy face and he looked like the straight man. Eventually, people would come right up to us - and address all the praise to me. Then they'd kinda throw him a bone because he was a good straight man - but because of that it was doomed from the start. But we never stopped being very good friends. Have you studied Gene at all? Kliph Nesteroff: Well, I always knew him from game shows, but it was only when I learned more about you that I found out he had done comedy. Bill Dana: Yeah, he became the king of game show mavens and he was very good at it. He was enormously good at it. I guess he made a living, after a while, warming up audiences. And that requires a specific talent, as you know. 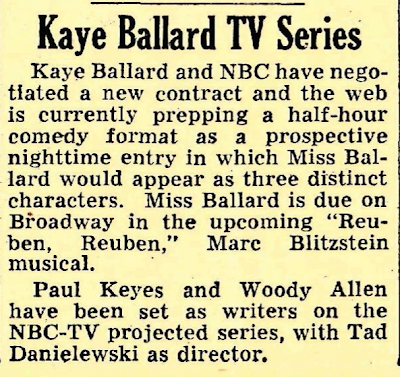 Kliph Nesteroff: One blurb I found said that Dana and Wood were shadowing writers on a Kate Smith summer replacement. Bill Dana: Yeah, wow. That goes way back. 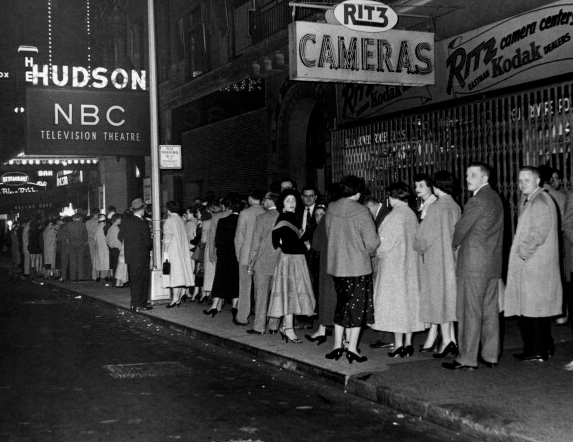 The Hudson Theater. 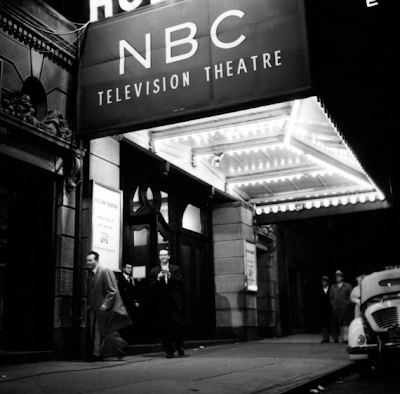 That was the first time we performed there and later on I had a whole career there with the Tonight Show. 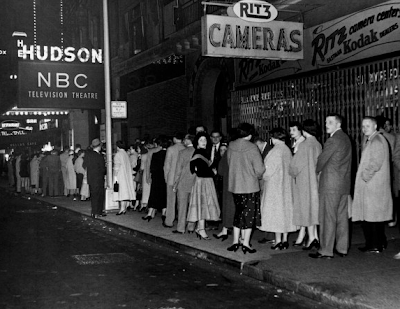 Yeah, Kate Smith had a daily show emanating from the Hudson. I believe we were still on the page staff even while we were doing that. Bill Dana: Well, that's possible. You know, as history proves there was no reason for him to have to steal material but... I don't know that he did... this is just a guess... in recounting these stories of thievery, they used to call Milton Berle the thief of bad gags so... Original material was part of what made Dana and Wood stand out... if we did. Everything we did we wrote ourselves. It's a damn shame we had no recording devices in those days. We had a very hip act. We were starting to get a following when it became... I use the word unbearable but in a context you'll understand... after the hundredth time somebody has walked right past you to your partner, who you've lived with and struggled with, and they throw you a little bone like you're nothing but a straight man... I am simply stating the truth. There is no Dana and Wood without Wood. But it was a crazy thing. I don't usually enjoy talking about this stuff, but this is sorta fun. Kliph Nesteroff: I have a Variety review - Dana and Wood, April 1954, playing the Black Orchid in Chicago with Wally Griffin, Betty Clooney... it said... and I don't know if you guys were canceled or just finished the engagement... but you were replaced by John Carradine - doing dramatic readings in your place. Bill Dana: (laughs) Oh, please send me that! Kliph Nesteroff: Did you ever encounter a comedy writer named Cy Howard? 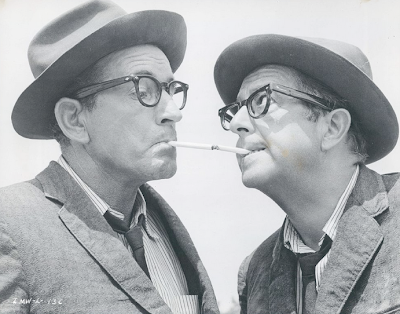 Kliph Nesteroff: Well, he created My Friend Irma and Life with Luigi, but character actor Marvin Kaplan told me that he became successful just ripping off other shows. My Friend Irma was just a knock-off of My Sister Eileen and so on... his career was sort of destroyed, apparently, by a Heidi Fleiss-esque prostitution scandal and that was the end of Cy Howard. Bill Dana: No, I don't remember that. I especially don't remember any kind of Heidi Fleiss type of thing, but I didn't know Cy. My history in the business of comedy goes back beyond Dana and Wood to when I was hired by Ed Simmons. 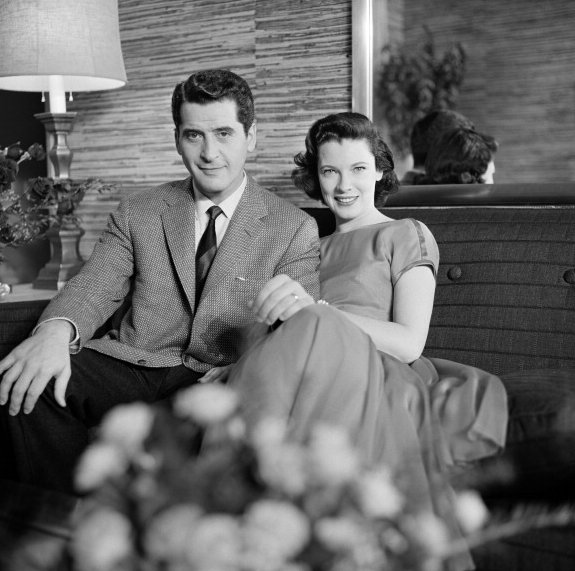 He was a Boston boy, the same area of the world as I. I guess he went on to work with Carol Burnett. A lovely man, but not very ambitious. 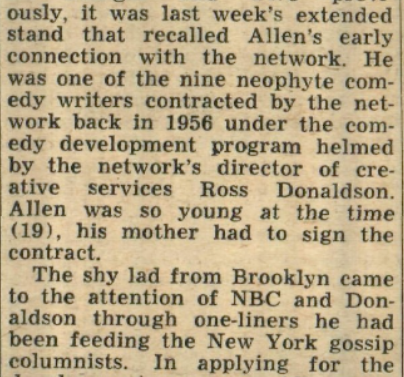 I knew Norman Lear before I knew Steve Allen even. Imogene Coca used to have these salons not only in her penthouse, but in Peekskill where she rented a place. I remember Hal March and I were out in a rowboat up there and he told me he was being offered a quiz show. I very sagely told him, "You're a comedian! Don't fool around! It's called what? The 64,000 Dollar Question? Are you kidding?" And he became part of a whole sociological change! He was a lovely guy. 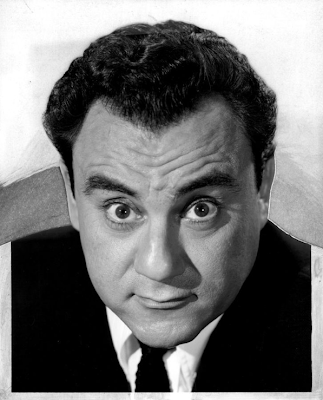 Kliph Nesteroff: He doesn't get any credit today, he isn't very well remembered. When he is remembered it's merely as a straight game show host, so he doesn't get credit for being a wit - which he was. Bill Dana: Oh, very much so. Very bright. 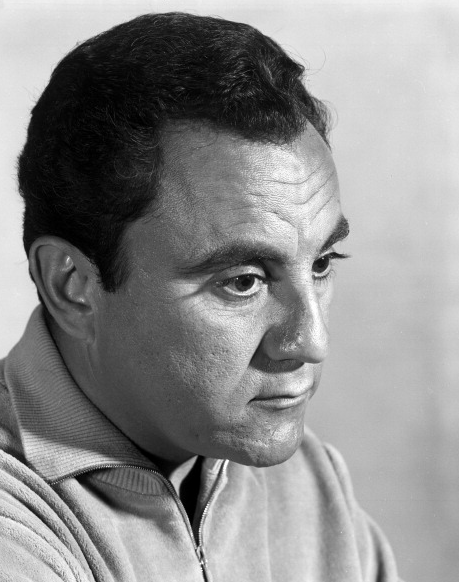 Kliph Nesteroff: I saw him serve as guest host on an episode of I've Got a Secret. Garry Moore was on vacation. Hal March hosted and he was hilarious. Bill Dana: Oh, yes. Do you know anything about Sweeney and March? Kliph Nesteroff: Very little. Other than the fact they existed, I don't know much. 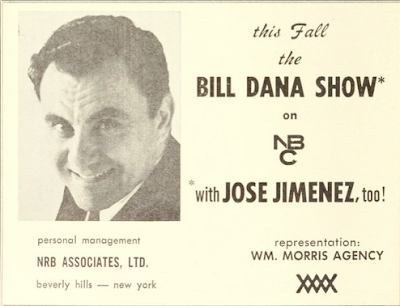 Bill Dana: When I first heard his name he was half of that comedy team. With Hal and me it was a social thing and we all giggled that his show was such a huge monster hit. If he had taken my advice he would have ended up working at Macy's. Kliph Nesteroff: Did you work with Norman Lear on The Martha Raye Show? Bill Dana: Yeah, Eddie Simmons and he hired me to just be like a go-fer. I'd do things that required some trust like going to Baltimore to pick up Gloria Lockerman. Do you know the Gloria Lockerman story? She was on The Martha Raye Show and she was this sweet, little Black girl. Oh, there was a lot of stuff there. 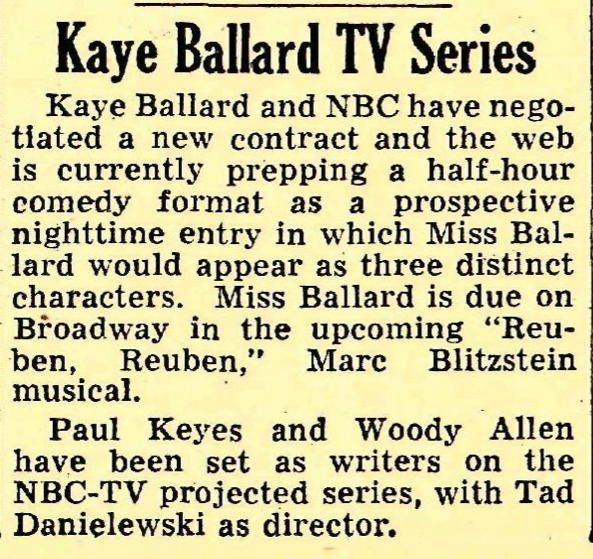 The show got in trouble because Talullah Bankhead and Martha Raye stood on either side of little Gloria Lockerman. 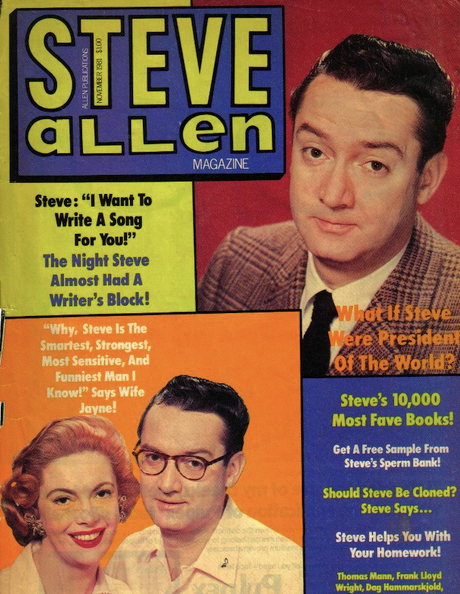 I encountered a lot of this [racist hostility] during the time I was head writer of The Steve Allen Show. 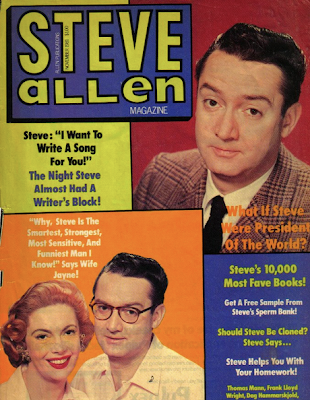 I was always the guy on The Steve Allen Show who checked the mail. 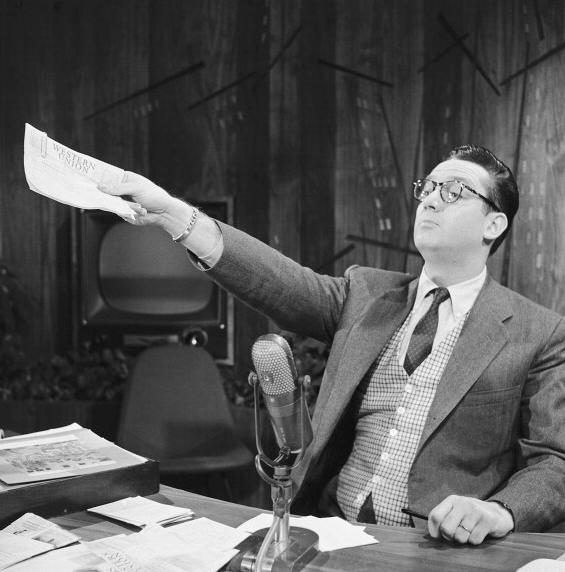 There was a lot of the expression, "Steve Allen keep your Jew nose out of Southern politics!" Remember the Emmett Till thing? I became very close to Steve because I was one of the only bachelors on the show, so I would always work late. I had no place to go so I stuck around the studio. Of course, it was the historical as well as the hysterical that was so much a part of that show. Bill Dana: Oh, what a lovely man - with an incredible background. Kliph Nesteroff: Right, his father was a famous songwriter. Bill Dana: Yes, his father wrote Smoke Gets In Your Eyes. That was Bill's wedding present. He got the copyright to Smoke Gets In You Eyes. Kliph Nesteroff: Oh, really? You know, you are mentioned briefly in Phil Silvers' autobiography. You worked on the Bilko show? 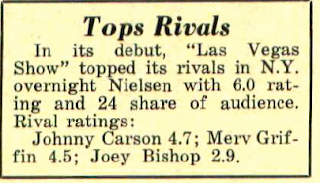 Bill Dana: Although vague to the exact timing, I did indeed get a temporary gig on The Phil Silvers Show. I believe it was through Phil Foster, whom I met during the closing phase of World War Two in France. Phil Foster was the inspiration for Bilko. He, like the character, had all kinds of schemes going as we waited in the Saint-Victoret staging area outside Marseilles to be deployed home. I do remember that everyone involved in Mr. Silvers' show liked him. 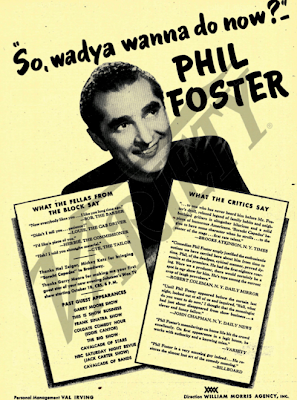 Phil Foster was a booster for Gene Wood and myself when Dana and Wood was starting out. Kliph Nesteroff: April 1956 - you worked on a special featuring Art Carney and Don Adams called A Salute to Baseball. Bill Dana: I remember that. That's a good example of chutzpah. It was the first time there was ever a major baseball special and every All-Star you can think of was in it. We wrote the Umpire School bit, which became a classic from that one night. God, those were remarkable days. 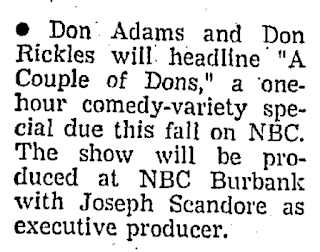 Bill Dana: Yeah, sure Tom Naud was on there with us and the Steve Allen people for a while. He's a positive feeling guy. 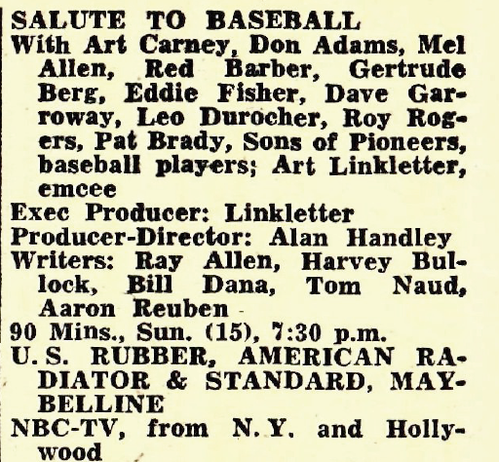 Kliph Nesteroff: Eddie Fisher and Dave Garroway were guest stars alongside all the ball players. Bill Dana: I never had much of an encounter with Dave Garroway. I would have liked to. When he was in his heyday he was brilliant. You never heard a bad word. When you're an NBC page, if somebody is a schmuck, it doesn't remain a secret for long. Kliph Nesteroff: I don't know if we got into this last time, although I talked about it with Pete Barbutti - The Las Vegas Show and the United Network. Bill Dana: Yeah, Pete is a wonderful guy. It still remains a mystery how they scuttled that show, but they did. 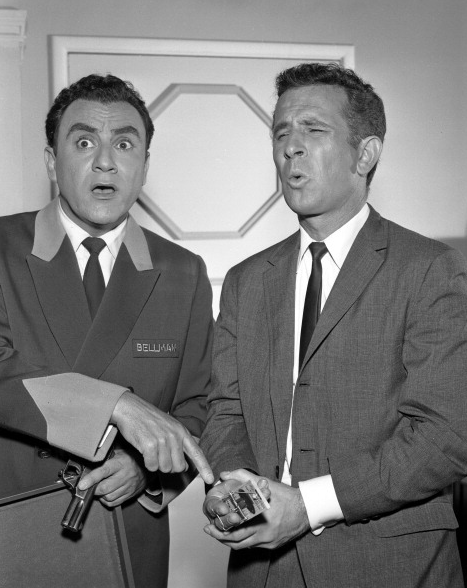 Rona Barrett called me on the day I received word we were destroying that awful man Joey Bishop. We were destroying him in all these major markets; Philadelphia, Seattle and so on. She called with the news that my show was going under. I sort of laughed at her. "I don't mean to laugh at you, Rona, but I'm looking at the numbers here and we are destroying Joey Bishop." She said, "Well I am sorry, Bill, but I got this news from so and so..." And the next day they dropped us. To this day I have no idea what the hell happened there, really. Have you ever interviewed Mace Neufeld? He's sort of retired, but he became a major executive at one of the studios. He was my friend, my manager, my partner, going back to Dana and Wood days, but we're not really pals anymore. 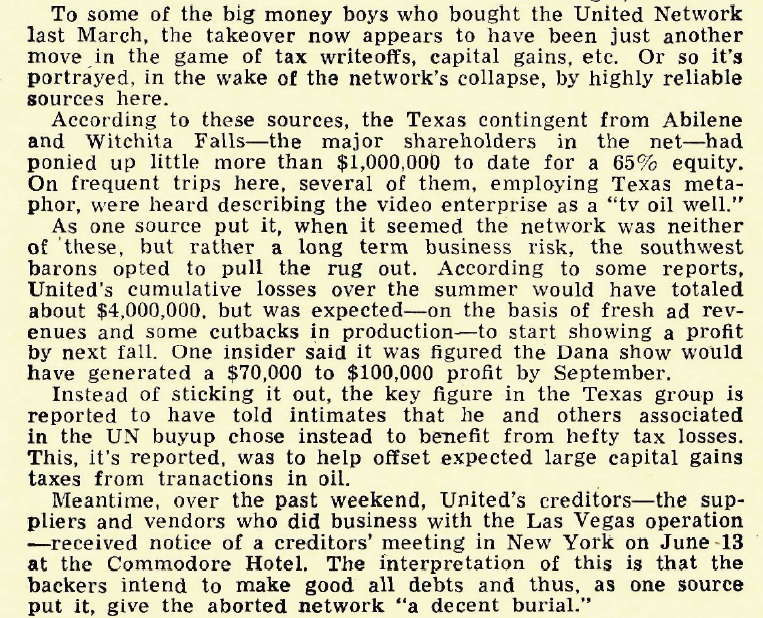 Kliph Nesteroff: The story Pete Barbutti told me was that the United Network - the main investors were Texas oilmen and they intended for your show and the whole network to fail so they could use it as some kind of tax write-off. 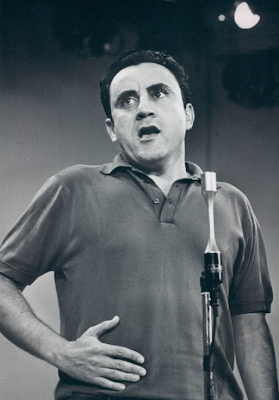 Kliph Nesteroff: There were a lot of comedians on the show. 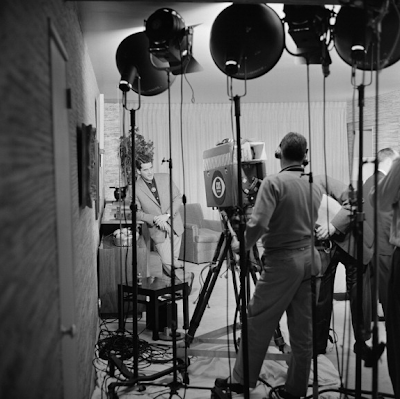 Bill Dana: Oh, yes, we had a lot of people on there that did their first real television - people like John Wayne. I remember I picked him up at the airport myself. Bill Dana: Yes, it was good. 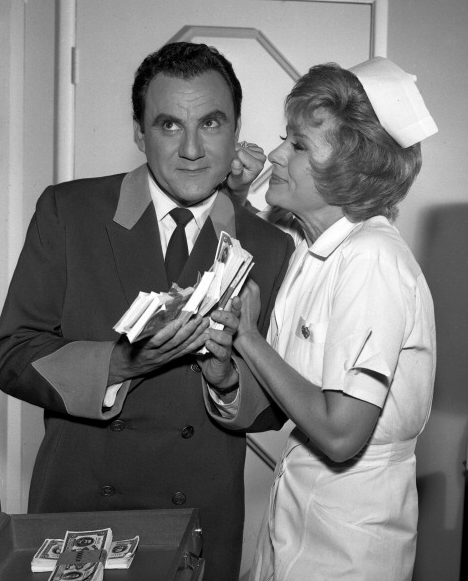 Kliph Nesteroff: Jackie Gayle was a regular on the show. Bill Dana: Was he a regular? I know he was on it, but I knew him from a whole other world. To me he's in a different category. He was part of the gang hanging out in front of Lindy's, that type of a guy. But he was very funny and a nice enough guy. 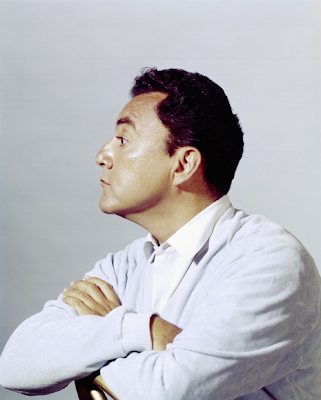 Kliph Nesteroff: Close with Lenny Bruce. Bill Dana: Yes, very much so and Lenny Bruce's mother. Is she still alive? Kliph Nesteroff: No, I think Sally Marr passed away around five years ago. Bill Dana: We used to call her Bootsie, but I don't know why. She was wonderful. She was a terrific judge of who was bullshitting and who wasn't. A very lovely lady. Kliph Nesteroff: One of the other people that was a regular on the Las Vegas Show was Cully Richards. Bill Dana: Yes. Cully was an old school guy. I probably met him when we took over the theater from the dreaded Jerry Lewis. But that's all for today, Kliph. I must rest.